There is increasing interest on the part of both the general public and scientific community about the impacts of sound on animals that result in physiological stress. Imagine a loud firecracker going off near you. Your heart rate increases and your body produces chemicals in response to this potential threat. Other animals may show similar changes in stress levels when exposed to some soundsPopper, A. N. (2003). Effects of anthropogenic aounds on fishes. Fisheries, 28(10), 24–31. https://doi.org/10.1577/1548-8446(2003)28[24:EOASOF]2.0.CO;2. It is important to examine stress levels as responses to sound, which like other environmental stressors, might affect growth and reproductive processes. Physical, chemical and other perceived stressors can affect fish and cause primary, secondary, and/or whole-body responses. Adapted with permission from Barton, 2002. Generally speaking, a stressor can be classified as anything that readies the body for action (causing a stress response). Stressors can last from seconds to minutes (generally the case in natural situations) or continue for days, weeks, and even months (especially in the case of anthropogenic stressors). A stress response involves a group of physiological and behavioral processes that enable an animal to adapt to changes in their environment, and such responses can vary in magnitude and duration. It is especially important to distinguish between normal or tolerable variations in response to environmental stress from those changes that will have consequences for survival and reproduction. Hormones regulate stress responses. Stress levels have traditionally been assessed by measuring the levels of stress hormones in the blood. Some hormones, such as adrenaline (epinephrine), are released rapidly into the blood, causing the alertness and activity of an animal to immediately increase. This acute stress response, or “fight-or-flight” response, enables an animal to respond to short-term changes in its environment. For instance, the secretion of adrenaline causes an increase in blood pressure and heart rate and a sudden boost in energy that would allow an animal to escape a predator. Other hormones, such as cortisol (a corticosteroid hormone), are released on a longer time scale and can have a slower, but more sustained effect on an animal. Although stress responses are necessary to promote survival, repeated or constant fight-or-flight responses and/or a long-term release of corticosteroids can negatively impact an animal’s growth, reproduction, immune system function, and overall health. A wide variety of stress responses have been noted for fishes. Corresponding elevations in cortisol can vary among species and/or among developmental stages of a speciesBarton, B. A. (2002). Stress in fishes: A diversity of responses with particular reference to changes in circulating corticosteroids. Integrative and Comparative Biology, 42(3), 517–525. https://doi.org/10.1093/icb/42.3.517. Potential stressors for fish include fluctuations in temperature, salinity, pH, and/or available oxygen; insufficient food supply; predation; and exposure to toxins. 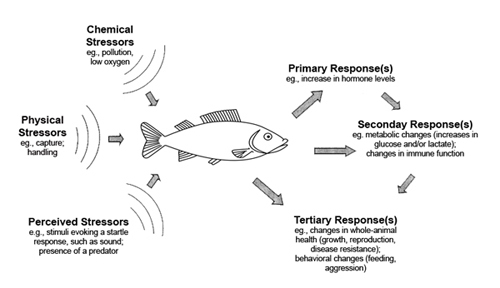 Anthropogenic sounds may also cause a physiological stress response in fishes. In fishes, stress responses to anthropogenic sounds have not been documented in the wild and have been primarily studied in laboratory experiments on freshwater fish. In one study, goldfish were exposed to continuous sounds at 170 underwater dB. Their stress response was estimated by measuring corticosteroid levels, but no significant increases in corticosteroid concentrations were foundSmith, M. E., Kane, A., & Popper, A. N. (2004). Noise-induced stress response and hearing loss in goldfish (Carassius auratus). Journal of Experimental Biology, 207(3), 427–435. https://doi.org/10.1242/jeb.00755. In another study, common carp, gudgeon, and European perch were exposed to shipping noise at 153 underwater dB and continuous white noise of comparable intensity for 30 minutesWysocki, L. E., Dittami, J. P., & Ladich, F. (2006). Ship noise and cortisol secretion in European freshwater fishes. Biological Conservation, 128(4), 501–508. https://doi.org/10.1016/j.biocon.2005.10.020. Their stress response was estimated by measuring excreted cortisol. All three species responded with increased cortisol secretion when exposed to ship noise, but no elevation was noted in fish exposed to continuous white noise. One long-term study examined a number of measures of stress response in cultured rainbow trout kept in 9.1 m in diameter aquaculture tankWysocki, L. E., Davidson, J. W., Smith, M. E., Frankel, A. S., Ellison, W. T., Mazik, P. M., … Bebak, J. (2007). Effects of aquaculture production noise on hearing, growth, and disease resistance of rainbow trout Oncorhynchus mykiss. Aquaculture, 272(1–4), 687–697. https://doi.org/10.1016/j.aquaculture.2007.07.225. Experimental fish were kept in a noisy tank (150 underwater dB) for eight months, starting shortly after they hatched from eggs. A control group from the same batch of eggs was maintained in the same way as the noise-exposed animals, except that their tank was kept far quieter (115 underwater dB). At the end of the experiment, fish were not only examined for hormone levels, but also for immunological responses, which are often highly correlated with very subtle stress. In such studies, fish are challenged with bacteria and stressed animals come down with the disease much more often than animals that are not stressed. The scientists found that there was no difference in stress responses in the control and experimental animals, leading to the hypothesis, at least for rainbow trout, that moderately increased sound levels do not result in stress. An alternative hypothesis is that fish are initially stressed but, over time, they habituate to the sound and their stress response disappears. Laboratory studies cannot, however, always inform us about the reactions of wild species. In addition, there is often the problem that in taking samples to test for hormone levels the very act of sampling may cause stress. Additional studies need to be conducted on other species and exposure to long-term noise in the field in order to further understand the relationship between human generated sound and the physiological condition of fishes. Robero, M., & Butler, L. K. (2007). Endocrinology of stress. International Journal of Comparative Psychology, 20(2), 89–95.